A cold sunny days walk to Icho and Seymour Tower, or as I prefer to call it The Two Towers walk. Just a great days walk to explore the area. Nearing Seymour Tower we came across the remains of a discarded gill net which though abandoned continues to catch fish. Considering someone must have gone to the trouble of buying, setting and checking the net it’s a shame they could not be bothered to remove it. This is a good example of how not to low water fish. 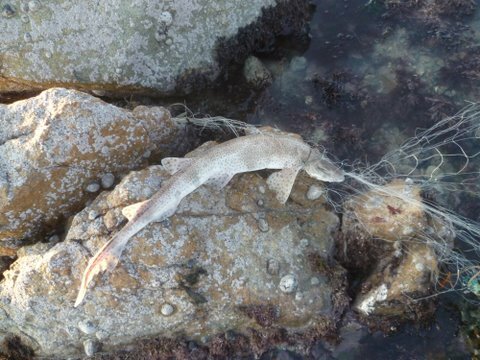 Unfortunately all around the coast of the UK and Europe discarded nets continue to catch fish. It is also surprising just how much of the junk washed up onto beaches is connected with the fishing industry. Looks like I may have to head out with the wheelbarrow to retrieve this bit of fishing junk. A shame as this does not represent the actions of most low water fishermen I know who are very responsible.